We ship UPS Ground FOB Pittsburgh, PA. Customer pays shipping charges which are based on distance, size, and weight. If you require alternate shipping arrangements or expedited shipping, please ask us. You will be responsible for all shipping costs. 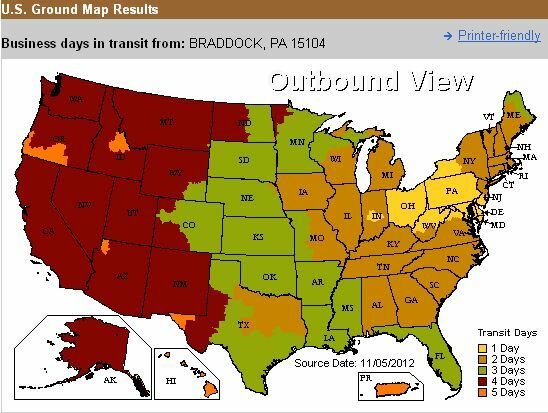 Although we have good rates from these shippers, we can also ship using your own FedEx or UPS account if you prefer. For international orders, most customers find it more cost effective to have us deliver to a US-based freight forwarder. 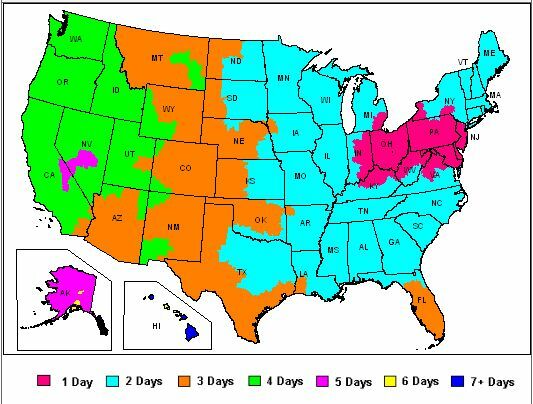 For estimated shipping times from our warehouse, please see the FedEx and UPS Ground Shipping Service Maps below. Some typical UPS shipping times: New York - 2 days; California - 4 days; South Florida - 3 days.